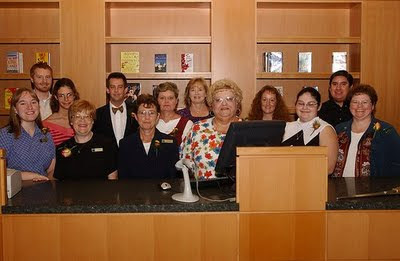 This weekend, the library is celebrating the 5th Anniversary of the opening of the "new" Central Library. Lots of festivities are planned. It should be a super busy Sunday @ Central! While perusing new books this week, I came across Morton's the Cookbook 100 Steakhouse Recipes for Every Kitchen. The food looks so good...had to go to the butcher shop today! This soup is quick, easy, and oh so tasty. In a deep stockpot, heat the olive oil over medium-low heat. Add both types of onions, the leeks, shallots, and garlic and cook very slowly, loosely covered, for 30 to 35 minutes or until the onions release their juices, are very soft and syrupy, and are lightly browned.Add the sherry, Madeira, beef and chicken base, thyme, herbes de Provence, and bay leaf. Raise the heat to medium and bring to a simmer. Simmer 4 to 5 minutes to cook off the alcohol.Stir in the demi-glace and bring to a boil. Lower the heat and simmer, partially covered, for about 20 minutes.Preheat the broiler. Remove the bay leaf, adjust the seasoning with salt and pepper, and ladle the soup into 10 broiler-safe soup crocks. Lay 2 croutons on top of each bowl of soup and sprinkle the cheese over the croutons. 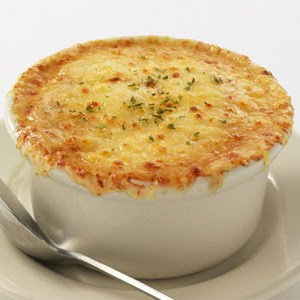 The cheese should cover both the crouton and the soup.Working in batches, broil the soup crocks 2 to 3 inches from the heat source for about 2 minutes, or until the cheese browns and the soup bubblesx around the sides. Use heavy oven mitts to handle the crocks and take great care removing the crocks from the broiler. Garnish each bowl with parsley and serve soup immediately. Preheat the oven to 450°F.Cut the bread on the diagonal into croutons that measure about 2 1/2 inches long, 1 1/2 inches wide, and 1/2 inch thick. Spread the croutons on a baking sheet and bake for 4 to 6 minutes or until golden brown. Turn and bake for 4 to 6 minutes on the other side, or until golden brown.Remove from the oven, slide the croutons onto a cool pan or rack and let cool. Use right away or store in a lidded container for up to 3 days. Note: beef base and chicken base (I buy the GFS brand at Gordon Food Service) are salty. Do not add the extra salt until you have tasted the soup. Once again I find myself being neglecting my blog. Lots of things are going on, but I haven't taken the time to sit and capture my thoughts. I've been trying to combine dog-sitting, writing a paper, and household maintenance this weekend. So far, I'm doing the best job with the dog...we've been on lots of walks in the neighborhood. 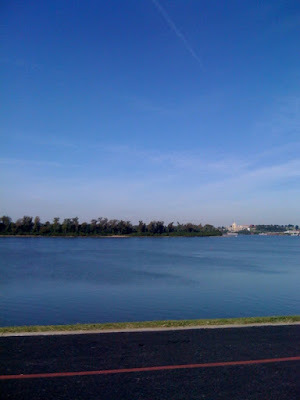 This morning we ventured to the Evansville Riverfront....just a block and a half from the house, but generally out of strolling range for me...I stick to the historic district and 'housepeep'. 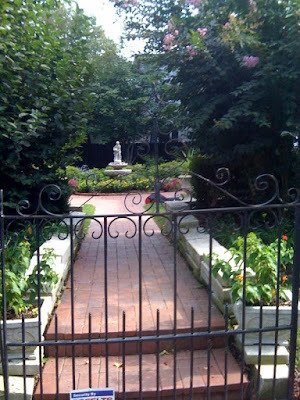 There are some really awesome gardens in the area, and they look so beautiful this year, thanks to all of the rain.